One of the most recognized aircraft in the world, the Consolidated PBY Catalina not only served in the U.S. Navy, but also with the air arms of Britain, Australia, New Zealand, Canada, the Netherlands and the Soviet Union. The PBY was involved in almost every major operation in World War II, and figured significantly in defeating the U-boat menace in the Atlantic. Produced by Consolidated Aircraft, the PBY Catalina was a flying boat which later became an amphibious aircraft, used by several countries in the 1930's and 1940's. It is a long range aircraft, which did not require a runway to operate, as it was capable of both take-off and landing on the water. The PBY's uses included maritime patrol, bombing, anti-submarine warfare, and search and rescue missions. Remembered for their role in rescuing downed airmen, the PBY saved thousands of lives. Catalina airmen referred to their aircraft as the "Cat" on combat missions and "Dumbo" during air-sea rescue. The name Black Cats refers to a select group of squadrons whose mission it was to strike at night. Painting their aircraft matte black, installing special radar and flame dampers over the exhaust ports, and often using only the lights on their instrument gauges to guide them, these squadrons were virtually undetectable at night. 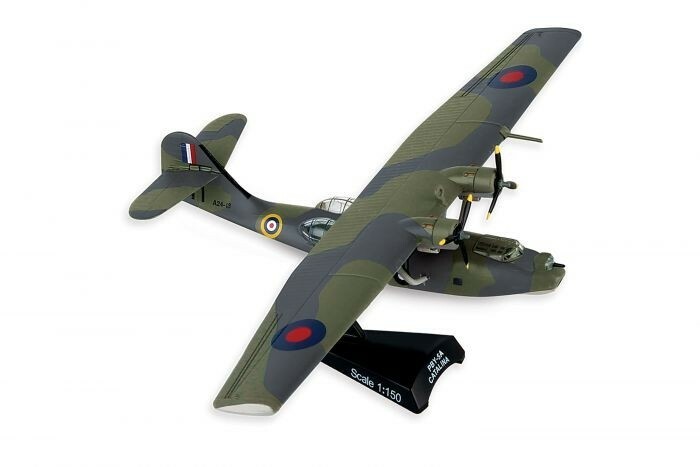 This Die-cast metal airplane model comes in 1:150 scale with plastic stand and is approximately 5 1/8 inches long with 8 1/4 inch wingspan.